“The works of His hands are faithful and just.” Psalm 111:7 NIV. All that is in God’s hands is in good hands. I am grateful for good friends, friends in whom I can trust and upon whom I can rely. I find solace in their friendship as well as their company. “A true friend is always loyal, and a brother is born to help in time of need.” Proverbs 17:17 NLT. I hope to be that kind of friend to others as well. In that sort of friend, you know your secrets and safety are secure in their hands, and you will have their help when you need. Of necessity, your circle of such friends will be small. For one and all, there will be times when your well-being is in the hands of another. However, some things are more than the best of friends can share. Life presents occasions when you must seek refuge in God. “Because God has said, ‘Never will I leave you; never will I forsake you.’ So we say with confidence, ‘The Lord is my helper; I will not be afraid. What can man do to me?’” Hebrews 13:5-6 NIV. Such times and circumstances require that they be placed in God’s hands. “In the beginning, You laid the foundations of the earth, and the heavens are the work of Your hands.” Psalm 102:25 NIV. The One described as, “upholding all things by the word of His power,” can be trusted with your cares and concerns. Read Hebrews 1:1-4 NKJV. Paul gave simple, practical instructions how to do that. “Be anxious for nothing, but . . let your requests be made known to God; and the peace of God, which surpasses all understanding, will guard your hearts and minds through Christ Jesus.” Philippians 4:6-7 NKJV. Prayer. “In everything by prayer . . let your requests be made known to God.” When you pray, you invite God to work His will in your situation. Worrying and whining about your difficulties brings neither peace of mind nor assurance of heart. Include God. Supplication. “In everything . . by supplication, let your requests be made known to God.” Supplication suggests a heightened sense of urgency and strong conviction that God alone holds your answer. 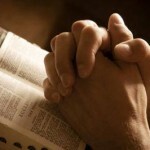 Pray earnestly. See Ephesians 6:18 NKJV. Thanksgiving. “In everything . . with thanksgiving, let your requests be made known to God.” Prayer and supplication remains unfinished until sincere thankfulness concludes your petition for God’s grace and intervention. Give thanks. “Devote yourselves to prayer, being watchful and thankful.” Colossians 4:2 NIV. Peace of God. “In everything . . the peace of God that surpasses all understanding will guard and keep your hearts and minds through Christ Jesus.” All that is in God’s hands is in good hands. Solomon advised, “Trust in the Lord with all your heart; do not depend on your own understanding. Seek His will in all you do, and He will direct your paths.” Proverbs 3:5-6 NLT. Be at peace. God’s peace can and should rule in your emotions and thoughts. Good Friday. 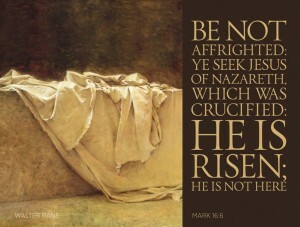 Gayle and I pray for you to have a glorious Easter celebration of our Savior’s Resurrection. Below today’s Devotional comments, I have shared a link to view a charming video of children telling the Easter story in the simplicity and wonder that only children possess. Click on “The Tomb Is Still Empty” to watch the brief video . . Blessings! “They took Jesus down from the cross and laid Him in a tomb.” Acts 13:29 NASB. Never allow your assumptions to become conclusions. You make assumptions every day; people and circumstances are seldom as you anticipate. You make assumptions about others and they make assumptions about you. As often as not, those are not particularly accurate. I am sure there are too many times when people assumed better of me than I achieved. Hopefully, there have been other occasions when I accomplished better than others’ presumed I could or would. There are two things I have learned. Never allow your assumptions to become conclusions. And always leave room to be pleasantly surprised. Jesus often surprises people. As a twelve-year-old, Jesus’ parents, “found Him in the temple, sitting in the midst of the teachers, both listening to them and asking them questions. And all who heard Him were astonished at His understanding and answers.” Luke 2:46-47 NKJV. Who could have expected a preteen to be as comprehending and conversant as those learned men who were his seniors? Jesus continued to be misjudged and misunderstood. In Jesus’ home town of Nazareth, those who knew Him were astounded. “What is this wisdom that is given to Him, that He even does miracles? Isn’t this the carpenter? Isn’t this Mary’s son?” Mark 6:3 NIV. Jesus always confounded others’ assumptions about Him, and continues to do so today. This seems most relevant to me as my thoughts turn to this Easter weekend, and as we consider the horrendous betrayal, and cruel, unjust suffering of Jesus, and observe His sacrificial death on the cross as though a common criminal. But Friday was not the end of His story; Calvary was just the beginning. “When they had carried out all that was written concerning Him, they took Jesus down from the cross and laid Him in a tomb.” Acts 13:29 NASB. His disciples saw His cruel and public death, watched his lifeless body buried and the tomb sealed and guarded. They assumed what seemed obvious was unchangeable. On the cross, when Jesus declared, “It is finished,” what God had intended and prophets had foretold had only just begun. Some disciples headed home. Others returned to former pursuits. Confused and afraid, some felt too lost to do much of anything yet. His disciples and followers assumed Jesus’ death was final. Death always had been. “But God raised Jesus from the dead!” Read Acts 13:30-31 NASB. An empty tomb was a surprise to everyone. In an unprecedented, miraculous occurrence nothing was ever the same again. God changes assumptions. Assumptions need not be conclusions. Easter changed the disciples’ assumptions forever. Jesus’ resurrection became the prevailing theme of the Apostles’ teaching and remains the Church’s signal testimony throughout the centuries that followed. “And with great power the apostles gave witness to the resurrection of the Lord Jesus. And great grace was upon them all.” Acts 4:33 NKJV. And still there’s more: “If the Spirit of God, who raised Jesus from death, lives in you, then He who raised Christ from death will also give life to your mortal bodies by the presence of His Spirit in you.” Romans 8:11 TEV. Easter is God’s promise that nothing is impossible, no circumstance hopeless, no distress unchangeable. My lifelong prayer and pursuit has been, ”I want to know Christ and the power of His resurrection.” Read Philippians 3:10-11 AMP. Jesus’ resurrection pledges abounding life now and eternal life forever. Today, I pray for you to experience the supernatural power of God in every circumstance. “That you may stand perfect and complete in all the will of God.” Colossians 4:12 NKJV. Lack of obedience impairs your ability to hear from God. God’s will is not secondary to anything, but primary to everything. “[God] works out everything in conformity with the purpose of His will.” Ephesians 1:11 NIV. Through obedience, God includes you in the accomplishment of His will in His world, as well as His will in your life. In his letter, Paul clarified the supreme priority of God’s will, “We have not stopped praying for you and asking God to fill you with the knowledge of His will through all spiritual wisdom and understanding.” Read Colossians 1:9-13 NIV. The will of God holds incomparable, personal benefits. Paul continues, describing unsurpassed results when the will of God inhabits your heart and mind: (1) living worthily, (2) pleasing to God, (3) abounding fruitfully, (4) a growing knowledge of God, (5) strengthening in His power, (6) being patient and enduring, (7) rejoicing and grateful, and (8) sharing a Godly inheritance. The Bible describes God’s will in these words – “His good, pleasing and perfect will.” Romans 12:2 NIV. I have found this to be true, “Your actions speak so loudly that I cannot hear a word you say.” Ralph Waldo Emerson 1802-88. Jesus told a story of a father and two sons. Their father asked each of them to work in his vineyard. One son refused his father, then reconsidered and did as his father asked. The other son readily agreed to do what his father asked of him, but neither started nor completed the task. Read Matthew 21:28-31 NKJV. Jesus asked his listeners, as I ask you, “Which of the two did the will of his father?” The answer should be obvious. Obedience is not what you say you will do; obedience is altogether what you do. You and I are to be defined as, “bond servants of Christ, doing the will of God from the heart.” Read Ephesians 6:5-8 NKJV. More than once, I remember my Dad asking, “Allen, did you hear me?” He was not doubting my physical ability to hear. He was accurately questioning my willingness and intention to obey. Hearing presupposes obedience. When King Saul disobeyed the specific instructions of God, the prophet Samuel asked him, “Which does the Lord prefer: obedience or offerings and sacrifices? It is better to obey Him than to sacrifice the best . . to Him.” 1 Samuel 15:22 TEV. For obedience, God offers no option, accepts no substitute. 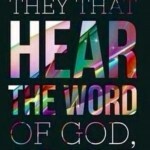 “God listens to the Godly man who does His will . . The man who does the will of God lives forever” John 9:31/1 John 2:17 NIV. Maybe you struggle to know God’s will at times. Maybe you have not recognized God’s voice or have not listened carefully enough. Or maybe you have procrastinated doing what God has spoken previously. Lack of obedience impairs your ability to hear anything further from God. God will not move forward in your life when you have unfinished business with His will. Today, I pray for you to do “the good, pleasing, and perfect will of God” from your heart. “Whenever you have the opportunity, you should do good to everyone.” Galatians 6:11. Helping others benefits you and blesses them. Everyone has a selfish moment when you think, “Why should I help?” Here are some answers to help when you feel like just taking care of yourself. Helping others makes life easier, every task lighter, and any heart happier. First in importance, God says to do so. The Bible is explicit. “Whenever you have the opportunity, you should do good to everyone, especially to your Christian brothers and sisters.” Galatians 6:11. “Do not withhold good from those to whom it is due, when it is in the power of your hand to do so. Proverbs 3:27 NKJV. God has given you what someone else needs. “Be generous with the different things that God gave you, passing them around so all can get in on it.” Read 1 Peter 4:8-11 MSG. As was said of the turtle on top of a fence post, “He didn’t get there without a little help from somebody.” Wherever you are and whatever you achieve, you received a little help from someone. Jesus said, “Freely you have received, freely also give.” Matthew 10:8 NKJV. You will be blessed in the giving. So don’t hesitate. “So don’t get tired of doing what is good. Don’t get discouraged and give up, for you will reap a harvest of blessing at the appropriate time.” Galatians 6:9. Never discount the value of God’s blessing. His blessing multiplies your success and compounds your enjoyment of that. You will accomplish more with God’s blessing than without. Apart from God, success may come with a measure of regret. “The blessing of the Lord makes a person rich, and adds no sorrow with it.” Proverbs 10:22. Not everything that looks like a blessing is, if you can’t find God there. You will feel better about yourself. That is not as small a thing as it might first appear. There is enough about life and our common frailty that doesn’t always leave you feeling good about yourself. There is great benefit from seizing every opportunity to do good for others, releasing an inner sense of self-satisfaction and well-being. Obedience is its own reward. Growth is the goal. When you lend a helping hand, everyone grows a little, and you will grow a lot. 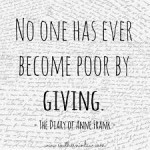 Helping others benefits you and blesses them. Today, I pray for you to learn that you grow only when you help others to grow. “A man who has friends must himself be friendly.” Proverbs 18:24 NKJV. From others’ fingerprints on my soul, I am a better man. Family and friendships are what make you and I who we have become, and are still becoming. “As iron sharpens iron, so one man sharpens another.” Proverbs 27:17 NIV. The exchange of ideas and experiences develop what we believe and influence how we behave. Few things in life, if anything, are as valuable as family and friends. New friendships are invigorating – so much to discover, so many new adventures together, so many new memories to create. But for me, enduring friendships are invaluable and irreplaceable. Each friendship has its unique patina from weathering the interactions of life together. The quality of your friendships begins with you. The Bible explains, “A man who has friends must himself be friendly but there is a friend who remains closer than a brother.” Proverbs 18:24 NKJV. You will have innumerable acquaintances that are for a season in your life but place high value on acquaintances who become friends. Don’t mistake acquaintances for friends. Invest in both; be grateful for both, but learn to distinguish the difference. Friendships require time and attention to mature. My life is richer, our family stronger, and our ministry graced by the spectrum of friendships God ordained and provided. Those friendships are comprised of some friends older in wisdom and years, some younger and welcoming fellowship and mentoring, and some of similar age and life experience. From each I have something to receive and learn, and to each I have something to give and teach. Friendships leave fingerprints. A friend eloquently wrote, “Without [friendships] I would hollow out like a good log that has laid on its side too long. Friendship has weighted my life with relational ballast. Like the texture of a wood floor it wears well under my feet everyday whether I know it or not.” (Old Friends, Dennis Gallaher) My lifelong friend, Don, recalled my saying to him, “Thank you for not letting me be who I would have become without your friendship.” To all my friends I owe a similar debt of gratitude. From others’ fingerprints on my soul, I am a better man. None of us are self-made. For better or worse, you are fashioned by the quality of people whose counsel you welcome, whose influence you embrace, and whose friendship you treasure. Solomon was known for His wisdom and offered wise counsel about friendship, “The righteous should choose his friends carefully, for the way of the wicked leads them astray . . A friend loves at all times, and a brother is born for adversity . . The pleasantness of one’s friend springs from his earnest counsel. Do not forsake your friend and the friend of your father.” Proverbs 12:26 NKJV/17:17 NIV/27:9-10 NIV. Today, I pray for you to value the gift of those God sovereignly places in your life.